Topographic features found in a normal fault zone forming ridges and valleys. 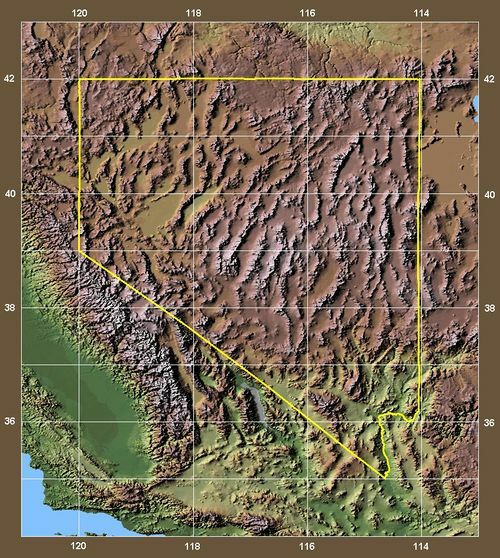 A graben represents a block of land that has dropped down relative to the landscape and a horst represents a block of land remaining higher than the general landscape. 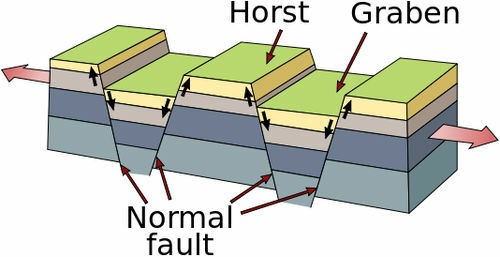 A "horst and graben" is a crustal-extension structure, composed of a series of normal faults, typical of the Basin & Range region of the US and Turkey’s West Anatolian Extensional Province. From the surface they appear as a series of ridges (horsts) and valleys (grabens) that run perpendicular to the direction of extension. Crustal extension results in horst and graben topography. Arrows indicate direction of extension. Image modified by Gregors for use on wikipedia, from an original U.S. Geological Survey Earthquake Glossary figure. Want to add an example to this list? Select a Geothermal Resource Area to edit its "Topographic Features" property using the "Edit with Form" option. This page was last modified on 12 April 2017, at 10:37.